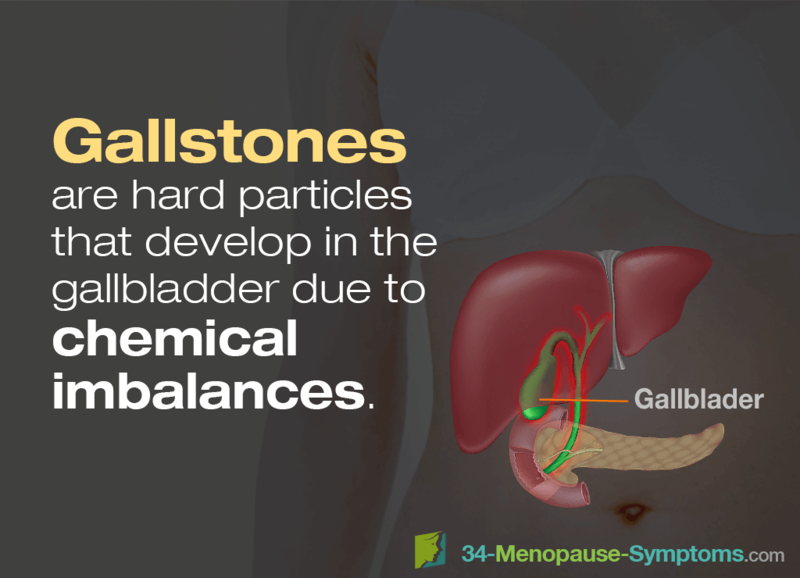 Middle-aged women who suffer from gallstones may wonder if these particles have anything to do with the extra pounds they have been gaining recently. To answer that, keep reading to find out more about gallstones, including if gallstones can cause weight gain and when medical treatment is necessary. Gallstones are hard particles that develop in the gallbladder - the organ beneath the liver that is responsible for the concentration of bile and its distribution in the digestive system - as a result of chemical imbalances in the bile. In four out of five cases, stones form from the crystallization of excess cholesterol. In the rest of the cases, gallstones form from excess levels of bilirubin, a waste product created when red blood cells break down. Also, stones can range in size, from the size of a grain of sand to the size of a large pebble, and can develop over many years. Moreover, stones usually don't cause symptoms and do not pose a threat to a person's health. Therefore, they can be difficult to detect or diagnose. Known as "silent gallstones," these do not require treatment and are not a cause for concern. However, when one becomes trapped in a duct in the gallbladder, it may trigger intense bouts of abdominal pain known as gallbladder attacks. These attacks tend to follow a heavy meal and may last for up to five hours. Other symptoms of a trapped gallstone include jaundice, fever, light-colored urine, and the passing of clay-like stools. Do Gallstones Cause Weight Gain? Gallstones do not cause weight gain. While it is true that you may be carrying excess weight on your body if you have gallstones, obesity is a common cause of gallstones, rather than a side effect of them. Because the primary cause of gallstones is excess cholesterol levels, this means that those who are overweight or obese with statistically higher levels of cholesterol than those at a healthy weight are among the most likely to develop stones. Also, studies have also found that those who carry their weight around their middle (as opposed to their hips and thighs) are more likely to have gallstones form. This type of weight gain - especially that which occurs in the stomach – is a common symptom of menopause. Somewhat confusingly, those who have undergone extreme or rapid weight loss are also prone to developing gallstones, whether this is through very low calorie intake or weight loss surgeries, such as the insertion of a gastric band. Furthermore, estrogen can have a cholesterol-increasing effect on bile. So, women are more susceptible to developing gallstones than men, particularly those who have been pregnant or taken hormone replacement therapy (HRT). Diabetics, sufferers of liver cirrhosis, and those with a family history of gallbladder issues are also among the most likely to develop gallstones. Gallstones are diagnosed through various methods, including ultrasounds, endoscopies, and other scans. Trapped stones are usually treated with the removal of the gallbladder itself during keyhole surgery. Though this may sound drastic, a person is still able to function normally without a gallbladder. Bile - rather than being stored, concentrated, and secreted from the gallbladder - is constantly dripped through the digestive system straight from the liver. However, unless you are experiencing discomfort, it is best to focus on treating the cause of the gallstones rather than worrying too much about the stones themselves. For menopausal women, this means putting into action a concrete weight loss plan that revolves around natural and effective options to regulate hormonal imbalance and promote healthy habits. Click on the previous link to find out more.